Anita Rani annouced as host. Live accompaniment by city of Prague Philharmonic Orchestra conducted by Matthew Freeman. Music by Hans Zimmer, Jacob Shea and David Fleming for bleeding fingers music. 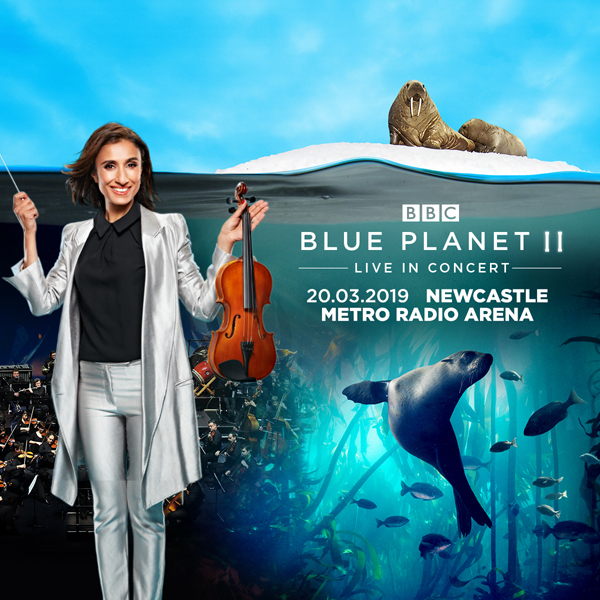 BBC presenter Anita Rani has been announced as host for Blue Planet II – Live In Concert, ahead of a 13-date UK & Eire arena tour in March 2019. A highly-respected TV personality, Anita Rani is a household name as one of the presenters of the BBC One series Countryfile, and regularly appears in and presents the BBC’s One Show. Anita has also presented programmes including Bollywood: The World’s Biggest Film Industry and Watchdog. In 2015 Anita was also a contestant on Strictly Come Dancing. Accompanied by the original immersive television music score by Bleeding Fingers Music, composed by Hans Zimmer, Jacob Shea and David Fleming, the concert will be performed live by the City of Prague Philharmonic Orchestra, and conducted by Matthew Freeman. Bringing the wonders and mysteries of the planet’s oceans and its inhabitants to the UK arena stage, Blue Planet II – Live In Concert will present a selection of incredible visuals from the BAFTA Award winning BBC One landmark series, highlighting the amazing natural wonders of our blue planet in breath-taking detail, projected on a giant state of the art 4K Ultra HD LED screen. The concert will feature exciting visuals from the show including the now infamous Tusk fish, the Crab and Eel rock pool chase and the ‘folklore-turned-reality’ Sea Lion tuna hunt, to mention but a few. The Blue Planet II television show was the most watched TV programme of 2017 in the United Kingdom, reaching 37.6 million viewers. During the filming of the Blue Planet II television program, film crews embarked on 125 expeditions, travelled to 39 countries and spent over 6,000 hours of deep sea diving armed with the latest state of the art equipment. Take a deep breath and discover a whole new world hidden beneath the surface of the sea. Hosted by Anita Rani, the Blue Planet II – Live In Concert will allow the audience to share an enjoy this voyage of discovery in an epic live audio-visual experience unlike any other.